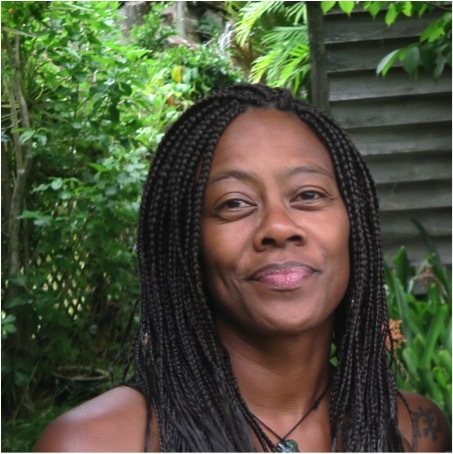 Poata "Alvie" McKree is an Artist, Qoya Teacher, and Art Therapist. Her sacred work is to foster and facilitate connection to the divine, the ancestors, and the earth. This manifests variously through facilitating Art as Medicine workshops, teaching Qoya classes on sacred land, and creating personalised movement rituals for those who are labouring to birth something new into their world. Her Art practice is directly informed by midwifery and the concept of womens’ work. She spent the first half of her adult life serving women as a Registered Midwife, before following the call of her heart to support women towards emotional and spiritual wellbeing. Alvie is currently lecturing at Elam School of Fine Arts in Auckland, New Zealand, where she and her husband Rāwiri are parents to a blended family of eight children. She can usually be found somewhere on Te Ika a Maui (the North Island of New Zealand) dancing, painting, writing, sculpting, walking the land and talking-story in the company of other creative women. She can also be found on Instagram:@art_as_medicine. When did you take your first Qoya class? Sunday, January 31, 2016. The date is emblazoned on my heart. It was a week before my birthday and it remains the best birthday present I ever gave myself. What does it mean for you to teach Qoya? It means taking the most life-changing spiritual practice I have ever engaged in and sharing it with women that I love. It means opening my heart a little more with every class and being fortunate enough to witness other women open their hearts too. An open-hearted woman is a powerful force for good in the world. What is your favorite song to dance to right now? Maisey Rika: "Whitiora" - It's great for heart-opening and free dance. And it's important for us as Indigenous women to be able to dance to music in our own language; to be reminded that our freedom and our healing can come from within ourselves and from within our own culture, language, and traditions. What book has inspired you on the path to embodying the feminine? Women Who Run with the Wolves by Clarissa Pinkola Estés. I re-read it every year, so as to remember. What would you tell someone who is thinking of taking a Qoya class for the first time? Do it! At the least you will leave feeling lighter, happier and more at peace with yourself. And that's just after the first class!.